How do you decide in what order to abandon your life? 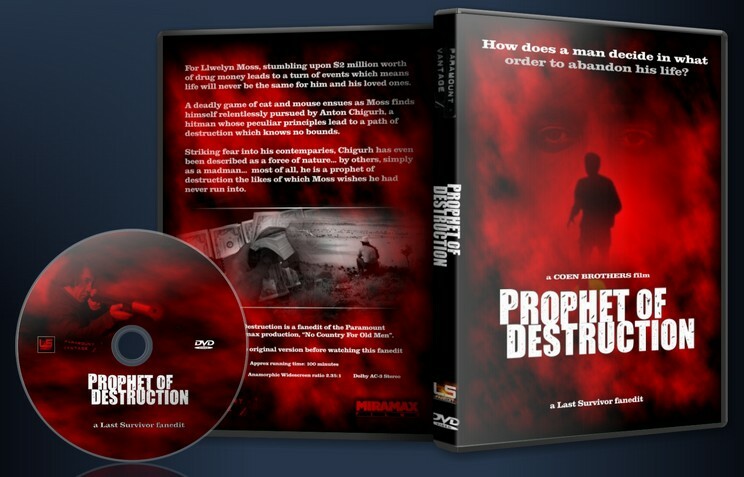 Prophet of Destruction is an attempt to present an alternative take on what the Coen Brothers laid bare at the cinema. By moving the focus of the movie a little more in favour of Chigurh, the hope is that the movie becomes more about exploring this almost unstoppable force of nature than it is about Sheriff Tom Bell’s retirement and how uncomfortable he feels in this country which is no place for old men. By no means is this intended as a “fix” or a “replacement” edit. I have too much respect for the Coen brothers to even suggest such a thing! After all, my goal here was not to overhaul the movie, more to pay tribute to it really. I do hope that Prophet represents a version which both they and perhaps the author Cormac McCarthey may have made had they decided to go down a slightly different path. So, grab your lucky quarter, close the curtains, turn out the lights as you discover the most unpredictable and dangerous hitman in history – Anton Chigurh: the prophet of destruction. No Country for Old Men is not a movie which really needs a fanedit – at least, for all its oscar wins and 5 star reviews, one would think that would be the case. However, despite some brilliant sequences involving the cat and mouse games between the hitman Anton Chigurh and his prey Llewlyn Moss, the monologues and voice-overs from Sheriff Tom Bell which hammer home the fact that literally, this is no longer a country for old men, seem to drag the movie out needlessly. This culminates in an ending which seems to split opinions everywhere you go. - Chigurh sequence when he’s caught by the police, taken to the station and then kills a deputy and escapes has now been removed from the beginning. - Chigurh masquerading as a policeman, pulling over and killing a driver, cut. - Chigurh’s first scene is now at the gas station and is placed before Moss evades the drug runners. Due to this, the shot of Moss seeing what turns out to be Chigurh’s car in the distance traveling to the gas station has now been replaced. - Sheriff saying goodbye to his wife, Loretta removed. - Sheriff and his deputy finding the burnt out car which Chigurh left now cut. The first time we see the Sheriff and the deputy is on horseback as they come towards discovering Moss’ truck. - Sheriff and deputy discussing “no exit wound” for the man killed by the highway, cut. - slight edit in the dialogue between Moss and his wife as he arranges the meet up at the Desert Sands hotel. She no longer mentions that she’s spoken to the Sheriff about her husband’s predicament. - Trimmed Chigurh’s walk through the corridor just before he enters the office of the man who hired him and shoots him dead. - Removed the scene of Sheriff Tom Bell and the local El Passo Sheriff having a coffee and chat about the state of the world. - Funeral scene trimmed to make it appear that Carla Jean may well be at Llewelyn’s funeral rather than her Mother’s. - Trimmed some of the dialogue between the Sheriff and Ellis, so that they discuss one story rather than two. - Last scene between the Sheriff and Loretta, cut. - New ending created… and that’s all I’m saying. Entertainment: I’m a huge fan of the Coens. Other than “Intolerable Cruelty” and “The Ladykillers” all their films are perfect to me. I was really skeptical of this edit when I first read about it, but you did an excellent job. Positives: I absolutely loved what you did with the ending. The last shot of the edit is beautiful! Likewise, the way that Chigurh is introduced now is fantastic. The majority of cuts were not missed at all. Negatives: The final scene with Sheriff Bell and Uncle Ellis seems a little out of place in this edit. I would have been satisfied with the Sheriff’s last scene in the motel room, or at least trimming down the Uncle Ellis scene a lot more. Next, removing the scene of Carson finding the hidden money creates a bit of a plot hole. After Lleweyln throws the money into the brush it becomes very unclear (at least to me) what happened to it. DISCLAIMER: This review is not meant as a personal attack on the editor. It is simply my opinions on the edit. Well I should start off by saying a read the novel of No Country for Old Men about a year before they made a movie of it. I enjoyed the book and I enjoyed the movie. I know the ending was something that some people really liked and some people really hated (i.e. “wtf? the ending is Tommy Lee Jones talking about his dream?!”). I guess I am kind of indifferent to the ending. I don’t love the ending but I don’t hate it either. On to the review: per my usual fanedit viewing policy, i avoided looking at the detailed cutlist (all I knew before watching is that the sheriff was getting scaled back), ive avoided reading any other reviews of the edit too (and as I type this, I still haven’t looked). 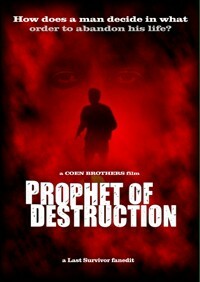 I rewatched No Country for Old Men last night and just finished watching Prophet of Destruction about 5 minutes ago. I liked the opening, I liked the music that was used here which if I remember correctly was a music cue that was used in the theatrical trailer for No Country. I liked the custom opening credits and title credits they looked very good. Chigurh’s new introduction into the movie was good. I was a bit torn about this as I watched it. Part of me says it is less suspenseful and less scary to have Chigurh and the gas station owner interaction presented to us without the previous scenes of Chigurh killing the cop and shooting the cattle air gun at the man on the side of the road. Having this knowledge, of the brutality that Chigurh is capable of (and the pleasure he takes in it), ahead of time gives you context to the gas station scene. Right away you know that Chigurh is an evil man and you can infer the implications of the coin toss. The way LS has introduced Chigurh in this edit, I will say in my opinion it adds to the mystery and makes it suspenseful in a different way than the original movie. The viewer does not yet know who Chigurh is, if he’s good or bad etc. And you don’t know what he’s gonna do to this gas station owner whereas in the original you’ve already seen Chigurh commit murder two times. Anyway, im probably over analyzing. On to the ending. I was really not sure what to expect. After I heard the rescoring as Chigurh leaves Carla Jean’s mother’s house and saw Tommy Lee Jones truck driving through the desert it left me curious. I really wasn’t sure where LastSurvivor was taking it. But after Tommy Lee Jones conversation is over and seeing the last scenes I really liked it. As LastSurvivor says himself in his “About this Edit” section of the DVD, Chigurh is an unstoppable force. So the way the last scene plays out: you think Chigurh has been caught and stopped…but nope. Nothing is going to stop this guy, he will keep killing. Initially I was a bit undecied about the inclusion of the Tommy Lee Jones scene where he is saying he’s quitting. Part of me thought, “that could have been cut out”. But in retrospect I think it is an important scene for two reasons: 1) I’m not sure there would be a good way to transition between Chigurh leaving Carla Jean’s house and him being arrested on the side of the road. So if nothing else the scene with the sheriff serves as a good transition 2) The last thing the man says to the sheriff is important “you can’t stop what’s coming” So after mulling it over I actually like the inclusion of that scene. And I definitely like the ending. As always Last Survivor’s DVD Menus are great. Simple yet professional looking. I need to get my menus looking like those! VIDEO EDITING: Looked great. No harsh cuts. I was watching on a huge HD tv and it looked quite good. AUDIO EDITING: Again, nothing jarring, sounded good. The rescoring was nice. Although in my personal opinion there were one or two spots where it didnt seem necessary but it didnt detract from the edit in anyway and this is just a matter of personal preference. ENTERTAINMENT: This was enjoyable to watch. I can’t say this is better than No Country for Old Men and I’d put this edit even with the original. Both are enjoyable movies. Great work LastSurvivor, looking forward to your next project!